Today I was in Dunn Woods at lunch and stopped to sit on a stump, it was really warm out. I was there just a few minutes when I saw a shadow and heard a hawk call. I gaze at the area east of the Law School and soon saw her fly to a perch high in a beech tree. She spent some time preening, and looking about, not hunting, it seemed more like she was checking it out. The male builds a nest, last year’s is still in place, but the one from year before (2007) is gone. I plan on keeping an eye on where they nest, last year they had 4 fledglings that that I spotted flying about. I thought the sound of the red-wing blackbirds was the sign of spring, but it has snowed since then. But today makes me realize, this is it! I was riding in the Bean Blossom valley on a cold mid-February day, and even though I had my Ipod in one ear, and there were some guys cutting wood in a field nearby, I clearly heard a hawk call. I stopped my bike and looked around and saw first one buteo, then 2 more circling above the nearby ridge. They made some further vocalization that sound like “kree”, not a red-tail hawk call, but a short crisp sound. I have not heard this hawk before, it could be red-shouldered hawk or broad-winged hawk, I just don’t know. Their wing tips curved up at the very end, and I think they had some white coloring underneath. They could have been migrants, but it seemed they were hunting, not migrating. That same day I heard my first redwing blackbirds along Shilo Road near Bean Blossom Creek. They are a harbinger of spring, much more so that robins, who often winter her. On my way out of town I ran into some bird watchers who had found a flock of bluebirds in the forest ridge overlooking Kerr Creek, so even though it will be still be cold, the migrations have begun. I am anxiously waiting for a fly over of cranes, I hear and then see them nearly every year. Wahoo! Another year of ice riding on Lake Monroe (and Griffy), you know, I sometimes worry the ice will not form (like in 2007). But this year the ice has been over 4 inches thick for over three weeks, and had many different faces. And yes, I wear my sandals (and 2-3 pairs of socks) on the ice. I have shoes that I use only when there is deep snow. I took 2 vacation days from work to ride on the lakes, and it could not have gone better. I know most folks find it hard to believe, but these days were really fun. I logged about 75 miles of the flattest riding you can do in southern Indiana, and never once came close to any real danger. During my 20 hours on the ice I saw 5 fisherman, 2 campers, 3 coyotes, 3 hawks, 2 bald eagles, and 1 great blue heron. We had no problem sharing the lake. The lake seems much smaller when you can ride rather than rowing, I’ve been end to end on my bike. Snow can be a help in winter riding. Up to 2 inches will help hold the bike upright, although it does slow you down (a better workout?) More than 2 inches is a challenge. Snow can be slippery. The only time I fell was riding on thin snow over rough ice. White ice generally has better traction than clear ice, but is often bumpier. Braking is a challenge, it is better to stop pedaling and put your feet down. Make wide turns only, or find yourself on the ice. Use low torque, ie don’t press hard on the pedals, or you may peel out and meet the ice. Cracks that have water one side or the other are scary, even though I know there is ice underneath the water. But who wants wet feet in January? I ride parallel till I find safe place to cross, which may be at the shoreline. There are coyotes, eagles, geese, and great blue herons at the lake in the winter. A cup of tea is quite refreshing when on the ice. The ice grumbling under your feet and pinging across the lake is a good thing, it is the sound of ice being made. 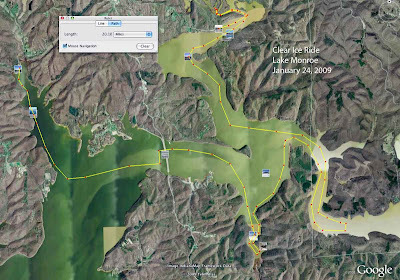 I mapped out a couple of my Lake Monroe routes after the fact, just to see how far I’ve traveled, and to fix in my mind where my photos were taken. 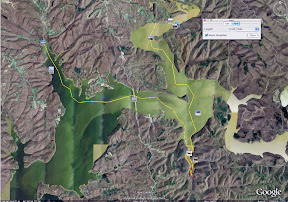 It does help to have a map on the lake, on my first ride to Elkensville, I somehow started up Axom Branch, rather than riding north and then east. If you’ve ridden the Hilly Hundred when it went east, the killer climb comes right after lunch. After riding the gentle valley north out of Nashville, you run smack dab into Bear Wallow HIll. It has has the largest rise of the climbs in our region, starting at 692′ in the valley to 1010′ on the ridgetop, a climb of 318 feet. 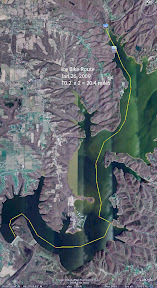 It is .75 miles long and using my Mitch’s Hill Toughness Quotient, it is a difficult hill at 424. However, its length and rise are more than any other hill I’ve found, and so this hill is tougher than the quotient would indicate. [318/.75=424] So I think I’ll go back and work on adding the distance and the rise together to get a second number to hill’s profile. I am pretty sure this could be integrated into the other number plus a variable for gravel, but I don’t know the calculus! 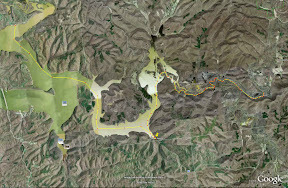 In comparison, TC Steele has a higher quotient at 474 MHTQ, but it’s a third shorter at .42 miles and rises only 200 feet. 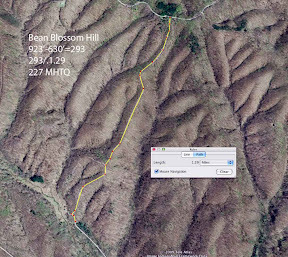 Bean Blossom Hill to the ridgetop is a long ride, 1.25 miles, and it rises 293 feet, but the math works out to a measly 227 MHTQ. So I would say Bear Wallow Hill is much tougher than Bean Blossom HIll, and probably harder to climb overall than TC Steele. I’ve climbed them both on my recumbent, so I know they are in the same neighborhood. But no doubt Bear Wallow is more of a killer, especially in warm weather. It just keeps going and going and going. But by pure numbers, Miller and Boltinghouse Roads are still the toughest paved Hoosier Hills, and McGowen is still the toughest by far. 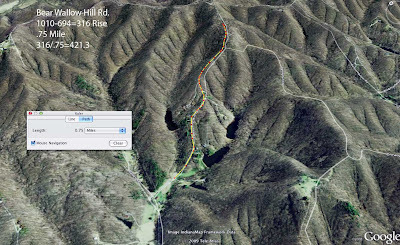 Author MitchPosted on February 5, 2009 May 20, 2016 Categories BikingTags Bike1 Comment on Bear Wallow Hill Rd.